She didn’t know how long she had sat there. Just two short days ago there were two people in the Galaxy she trusted. Now one was absent and the other withdrawn. Life was simpler as a slave. At least I knew I couldn’t trust anyone. Her arms were wet with tears for grief and exhaustion. In one hand she still held her own Lightsaber. After a few minutes she realised there was a metallic object digging into her hip. Swinging her legs around the medical bed she carefully placed her own weapon next to her and unclipped the object from her belt. It was the Saber she had stolen during her fight with Rala. She ignited it, and gazed at the red blade. Her mind was doing overtime. But Rala never intended on making a red bladed Lightsaber. That’s why she joined me on Ilum. Why the Hoth did she have two of these things? She jumped down from the bed, clipping her own blade to her belt and placing her friend’s hilt in her satchel. If she wanted answers, she only had a day or two to get them. She used a basin in the medical wing to rinse her face and lekku, checked out as a patient and made her way to the combat training area. The Warriors had separate training facilities to the mystical lore specialists, so the Twi’lek felt a bit lost. “Ah the Apprentice of Lord Vitae, so good to see you.”, a female voice called to her. “And you are?”, Talitha questioned. “Of course, we’ve never been properly introduced, I am Lord Zash. I was just wandering around looking at some of the newest recruits.”, the Sith Lord smiled. “Pleased to meet you,” the Twi’lek started cautiously. “Are you looking for someone?”, the Sith Lord asked. “In which case I should go to him now.”, Talitha urged. And with that she turned and left the room. Not for the first time this week, Talitha’s brow furrowed. Shaking away the thoughts she returned to her mission at hand. After a few moments trying not to look lost, the Twi’lek found Overseer Tremmel’s office. Pushing the button, the door slid sideways revealing the stark desk and the dark-skinned human known as Tremmel. She stood and waited, instead of entering. “Yes, Apprentice? If you have something to ask I suggest you do so quickly. I don’t have long.”, Tremmel beckoned her in. Tremmel reached into a drawer in his desk and pulled out a small, carved wooden box and placed it on the desk surface. “Before I tell you that, Rala confided something in me.”, he began. Looking around he pushed a button under his desk which shut the door and told his astromech to broadcast white noise for 5 minutes. “Go on, Overseer”, Talitha pressed. “Hence the red blades?”, Tal asked. “She told me that if she was…defeated…and you came looking, you were to have this.”, he motioned to the box. The Twi’lek stepped forwards and prised open the lid. A beautifully engraved Lightsaber hilt was inside – Rala’s Lightsaber. A connection to her lost friend. “I’ll make it work.”, she stated. “I’m sure you will, use your feelings to repair this hilt. Was there anything else?”, he asked carefully. “Her injuries? I was blacking out myself…in the moment.”, Talitha stammered. “You had her seen by med droids?”, Talitha asked. Talitha’s eyes darted around. Why was Rala in the minority of double-checked cases? Who was Barak Khan? 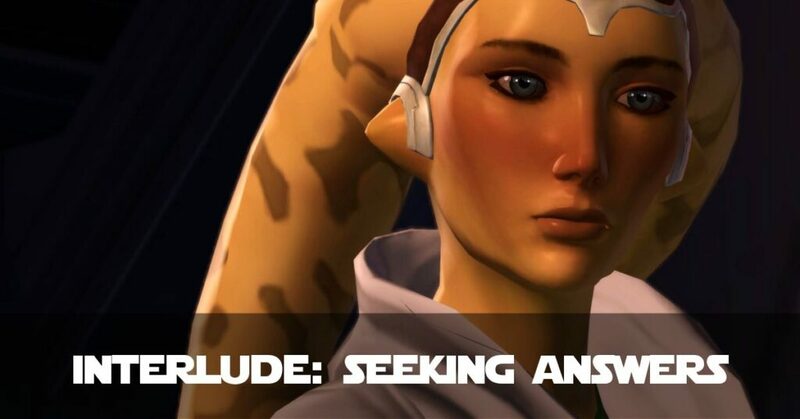 And how would she find these answers if she was shipped to Dromund Kaas? “Thank you Overseer, I won’t take up any more of your time. I need to pack. And to think.”, Talitha bowed her head. “You’re most welcome. I try to do good by my students. Not that it ever served me well.”, Tremmel had a saddened look in his eyes. “For what it’s worth, I fought Rala at least twice. She was trained well.”, Talitha’koum offered. She placed Tremmel’s saber in from of him and lifted the box carefully in both hands and cradled it to the animal care area of the Academy Grounds. Talitha found her TaunTaun being fed by a caretakers. Wrapping her arms around the neck of her furry friend, she buried her head in his fur. The TaunTaun whinneyed as though he understood. Once happy she was alone, they both sat down. Taking the hilt out of the box, she ignited it. A searing green blade stuttered forth, crackling, before expiring again. The Twi’lek had some soul searching to do, and the trip to Dromund Kaas would provide ample time for that. With all her belongings fitting into just three small bags Talitha looked around her quarters for the last time. It would be filled by another student soon enough. Her Master had gone ahead of her to the Imperial Capital. That meant it was her and around twenty new Apprentices taking the shuttle to the Capital ship that awaited them. A new chapter in the former slave’s life was beginning, even if the echoes of the previous chapter still followed her. Aboard a separate transport, Lord Resista Vitae was kneeling over a group of fallen Acolytes. Some Zabrak, some human, some Twi’lek and some Rattataki. She had fought for them not to become food for the beast pens. Aware of her surroundings she was careful to conceal her light. The final wounds varied from Lightsaber gouges to head fractures and burns from Force abilities. The Sith had to learn respect for the Living Force, even if it cost her life to teach it. Surrounding herself with the Force she begged that it wouldn’t come to that. Talitha won’t be left alone again, but I need your help, she petitioned.